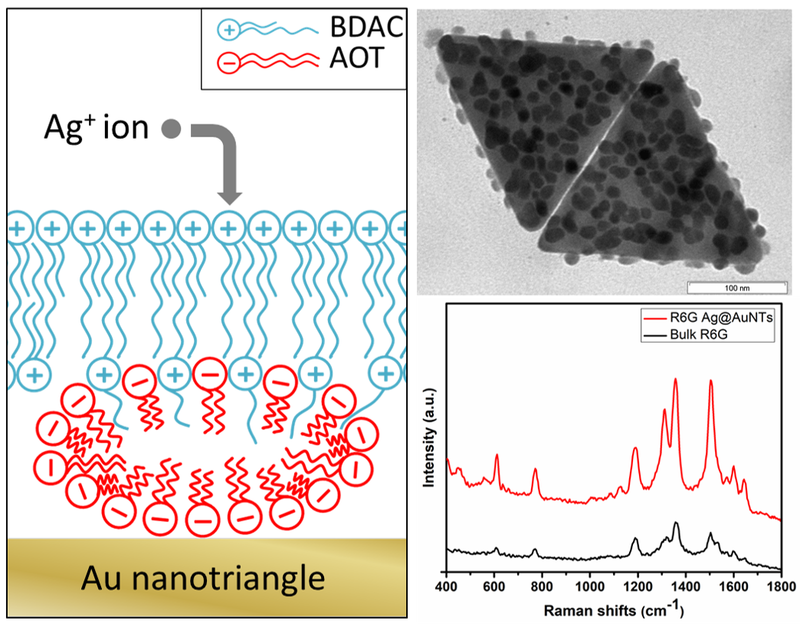 Negatively charged ultraflat gold nanotriangles (AuNTs) stabilized by the anionic surfactant dioctyl sodium sulfosuccinate (AOT) were reloaded with the cationic surfactant benzylhexadecyldimethylammonium chloride (BDAC). Because of the spontaneous formation of a catanionic AOT micelle/BDAC bilayer onto the surface of the reloaded AuNTs, nreduction of Ag+ ions leads to the formation of spherical silver nanoparticles (AgNPs). With increasing concentration of AgNPs on the AuNTs, the localized surface plasmon resonance (LSPR) is shifted stepwise from 1300 to 800 nm. The tunable LSPR enables to shift the extinction maximum to the wavelength of the excitation laser of the Raman microscope at 785 nm. Surface-enhanced Raman scattering (SERS) experiments performed under resonance conditions show an SERS enhancement factor of the analyte molecule rhodamine RG6 of 5.1 × 105, which can be related to the silver hot spots at the periphery of the undulated gold nanoplatelets.